When I lived in Argentina during the ‘90s, there was a sense of mistrust about the currency. Inflation had already devalued a lifetime’s worth of savings, and many feared it would happen again. Since then, runaway inflation ravaged the country not once but twice. That’s why people hid gold in their walls and kept little in cash. And what may have seemed crazy to outsiders turned out to be great foresight. Since 1999, the Argentine peso lost 96% of its value. Meanwhile, gold returned over 300% in the last two decades. 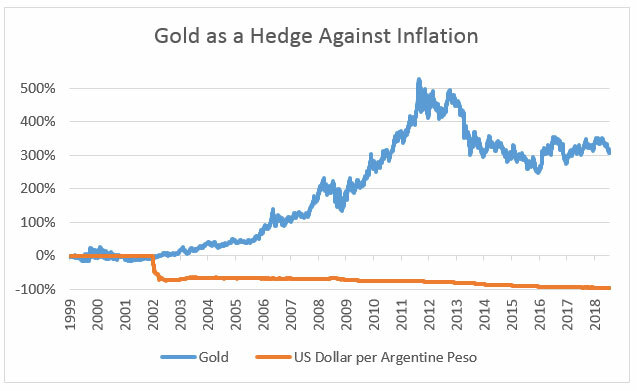 Gold is a great hedge against inflation. With gold reserves held by every nation, its value is universally accepted. The yellow metal is the oldest store of value still in use. Hundreds of currencies have come and gone in the millennia of gold’s use. The Sprott Natural Resource Symposium, a gathering of natural resource executives and investors, is a great gauge for the state of the market. And the recent slip in gold left the precious metal investors at the symposium feeling disappointed. There isn’t much demand for gold right now. Income investors are starting to buy into bonds thanks to climbing interest rates. Speculators of the precious metal lost hope this summer that fear of a trade war would spur a rally. And a strengthening dollar hurt gold prices. Gold is unloved and on sale. Now’s the time to buy. For contrarian investors, this is the perfect buying opportunity. Gold is back to where it was about a year ago. With prices low, now is a great time to start building a position in gold or adding more. One of the best ways to do that is through the Sprott Physical Gold Trust (NYSE: PHYS). After a simple registration process, shares are redeemable for physical gold. That allows for both ease of trading and redemption for the actual asset. Next »5G Technology and Augmented Reality (AR): What’s The Hype?